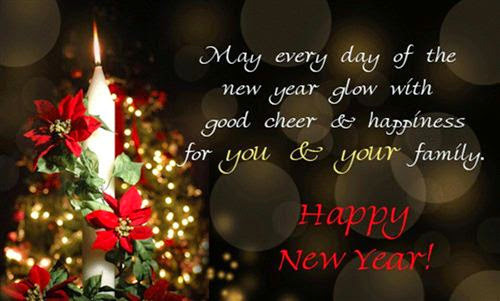 May each day of the New Year bring you joy, happiness and prosperity. Wishing you and your family a very Happy New Year! Comments off! Enjoy your day! Welcome to Saturday's Critters ! 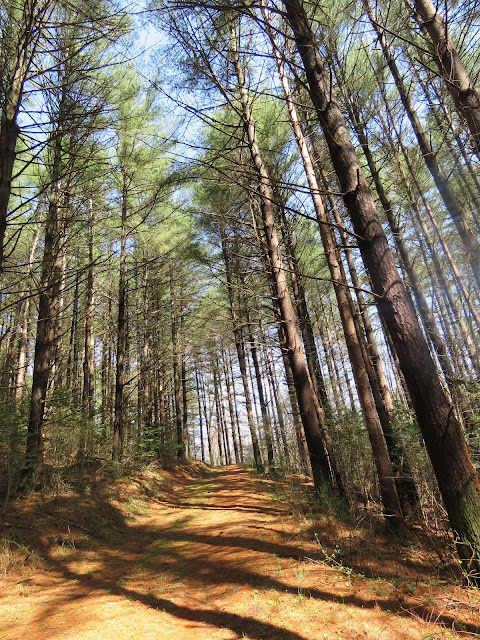 I want to thank everyone who has visited and commented on my blog this past year. I wish you all the best in 2019 and a VERY HAPPY NEW YEAR! If you love all God's creatures like I do and also like to blog about them and take critter photos this is where you can share your critter post. Link up your post and share your critters, join in with my critter party ! You can share any kind of critters the real ones, pretend ones, statues and paintings, a new or old post! 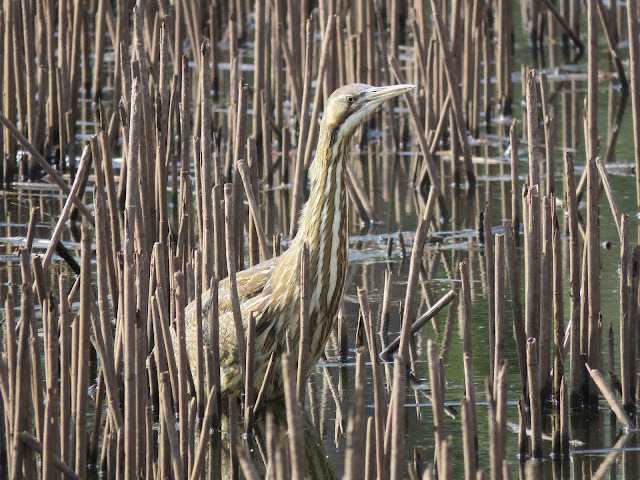 I am sharing some of my favorites birds from the past year's blog posts. I hope you enjoy. I wish everyone a happy, healthy New Year. 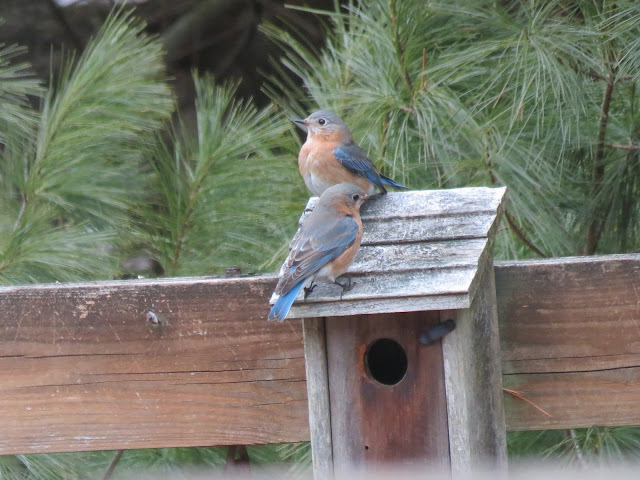 February 2018, a couple of Blue Birds. March 2018, the Great Blue Herons return to the neighborhood nest. April, 2018 a couple of Pine Warblers with a Downy woodpecker. July 2018, Osprey with chicks on nest. September 2018 a couple of Bobolinks. November 2018, for most of this month the Eastern Screech owl was seen in my front yard. 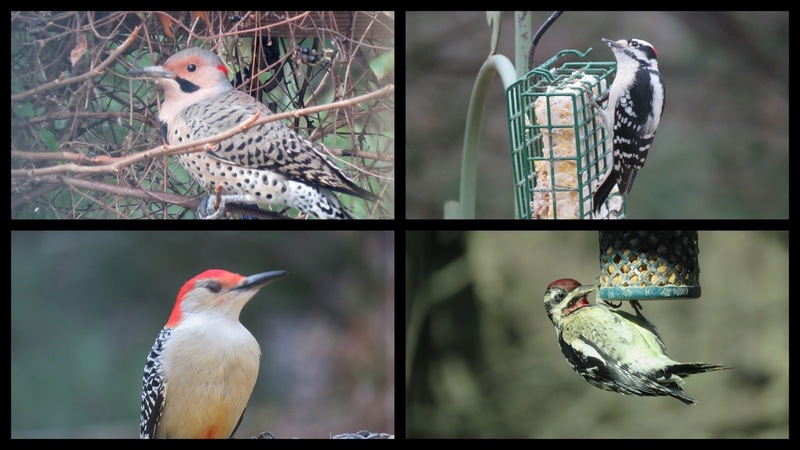 December 2018, the Yellow-bellied Sapsucker came daily to the feeder. I appreciate and thank everyone who links up their post and for all the wonderful comments ! Also visit: I'd-Rather-B-Birdin. Thanks to the gracious host: Anni. 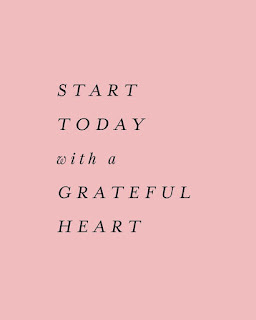 Happy Thursday, wishing everyone a great day! I hope to see you on Saturday with a critter post. If not I wish everyone a happy healthy New Year! 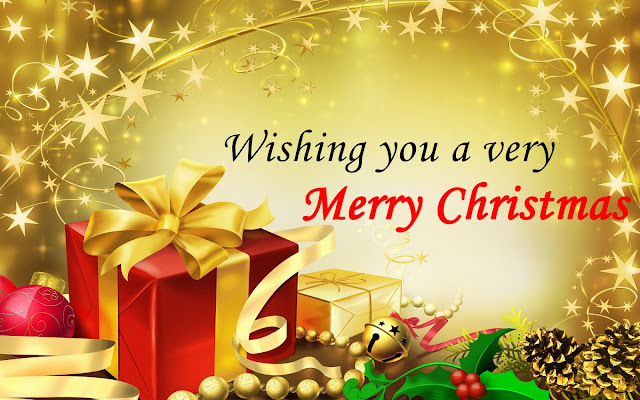 May your Christmas sparkle with love, laughter and goodwill! I want to thank everyone who has visited and commented on my blog this past year. I wish you all the best in the New Year and I hope to see you all again in 2019. I am taking a break, slowing down my blogging and commenting the next few weeks. I will only be posting my Saturday's Critter meme. I hope everyone takes time to enjoy the holiday. Merry Christmas to all who celebrate. Pine Siskins and American Goldfinches at the feeders. Can you see Chewy over in the corner of the deck, he is looking for the squirrels. Nibbles looking out for the squirrels. 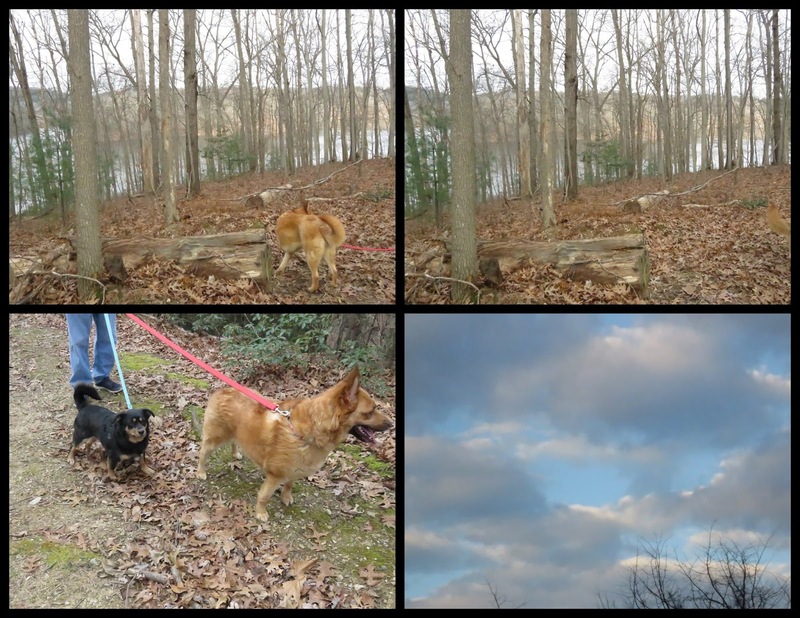 Hubby took the grand-dogs for a walk every day while they were staying with us. Hello, Happy Monday, enjoy your day and have a great new week! Saturday's Critters will be happening as usual. I am taking a blog break till after the holidays. I may still try to visit sometimes and comment. 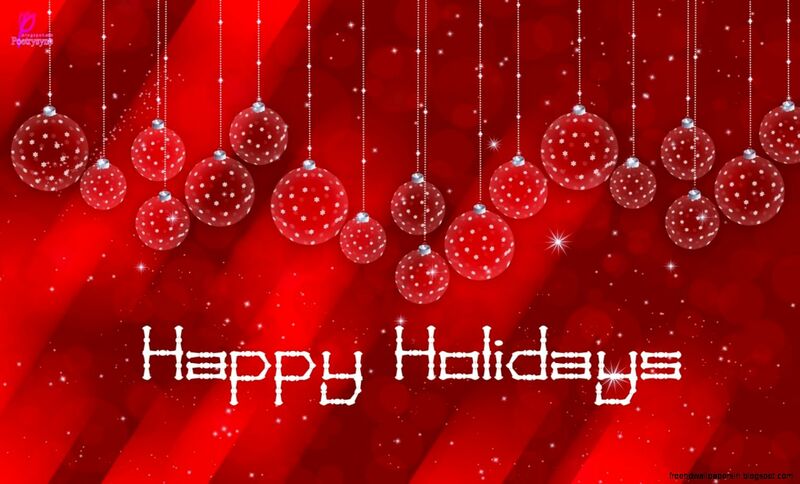 I want to wish everyone a happy holiday season. Merry Christmas!! On November 30th I happened to be looking out my window and saw 4-5 Eastern Bluebirds in my yard. They were checking out all my bird houses. I am not sure if they just wanted a home for the night so they could stay warm. I did not see them after that day. I hope they come back. House hunting, this was a fixer upper and needs a new paint job. The male is peeping inside the house, while the female peeks around the corner. On the morning of Dec 3rd I was able to take some photos of the crescent moon with Venus right below. Zoomed in to see a closer look at Venus. 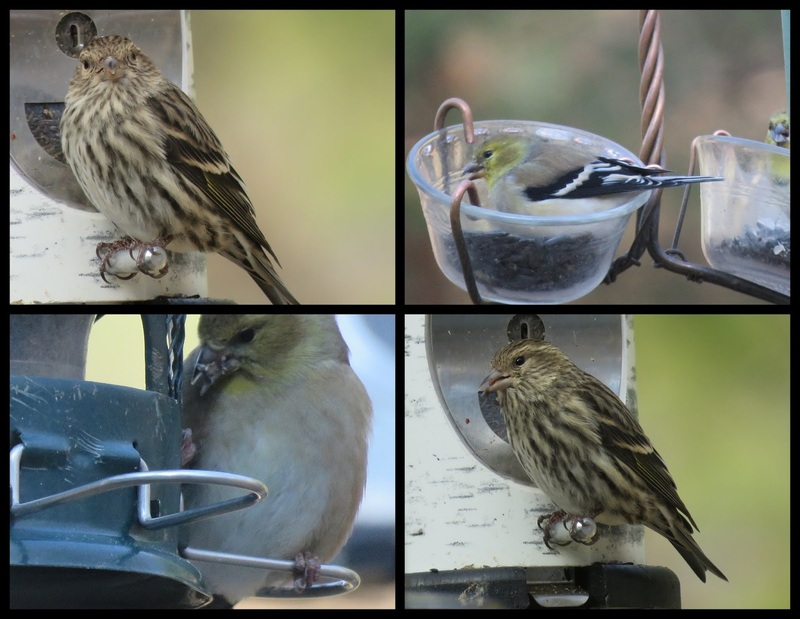 Sorry I cropped out my curtains on the photo below of a couple of Pine Siskins and Goldfinches. The Pine Siskins have a thin yellow stripe on their sides. A closer look at the crescent moon, it is pretty. Some times my birds all disappear during the day, I think a hawk is hanging nearby or maybe it is the Screech Owl. One day I saw an Eagle flying over the yard, I wonder if the eagle would make the small birds nervous. I am thankful for sunny days and clear skies. I am thankful for all your visits and comments. 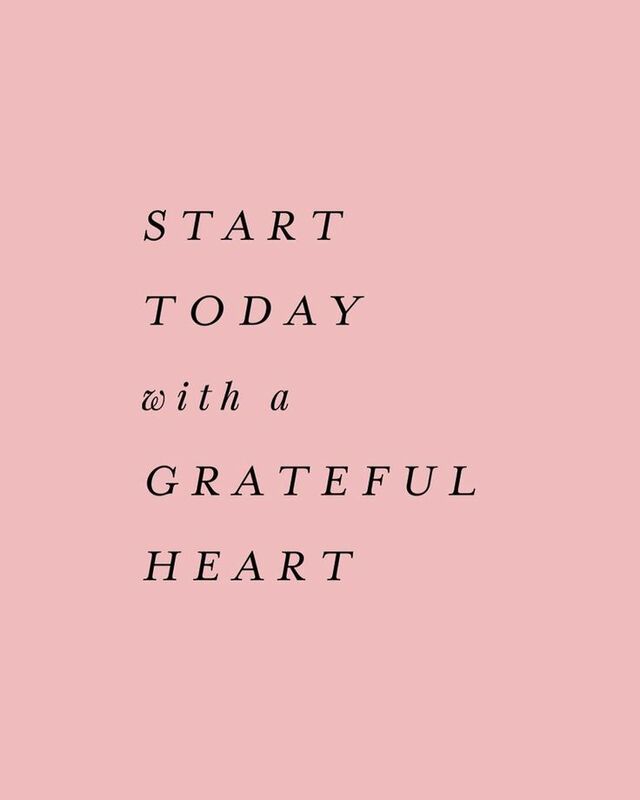 Thank you Michelle for hosting Thankful Thursday. Thanks so much for visiting and for your nice comments on my previous post. Have a happy day! Happy Birthday to my dear Hubby! Mondays are rolling around pretty quickly, at least for me. After the Thanksgiving holiday I decided to put up my little pre-lit Christmas tree. I enjoy looking at the lights and the ornaments I collected over the years. 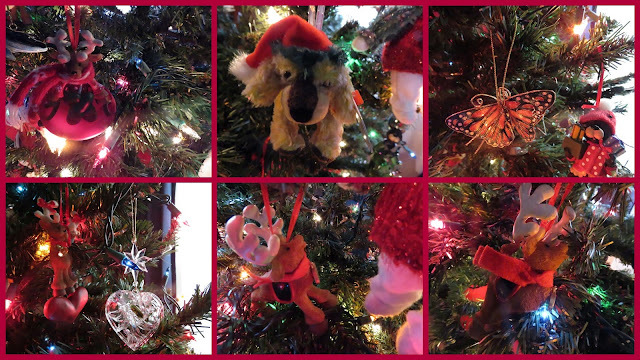 I have a cute collection of Santa Ornaments, bird ornaments and some reindeer and various other festive ornaments. Since it is just hubby and I, the only decorating I do is this little tree. Ornaments for the birdwatcher. I love the owls. 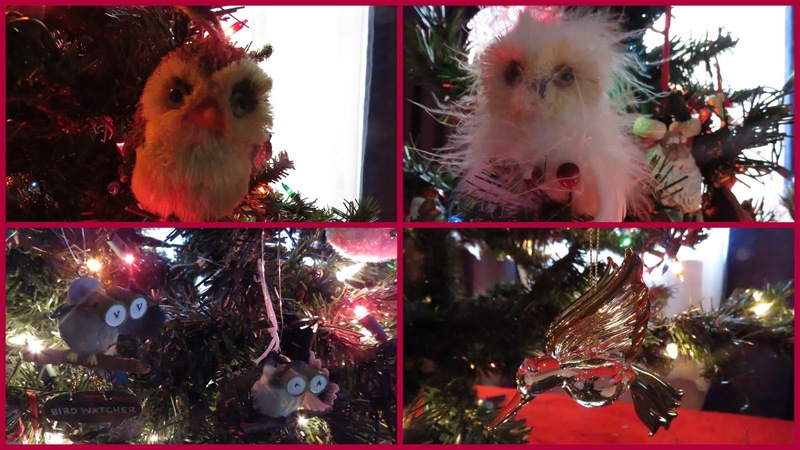 A closer look at the birdwatching ornaments, they are cute. 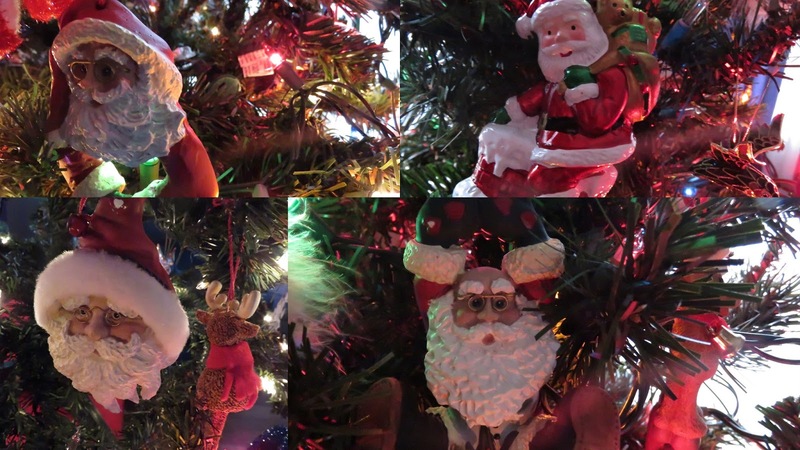 A few of my Santa ornaments. Reindeer, dog and butterfly ornaments. The tree with just the lights. Now, I have the whole month to enjoy the tree. It will come down right after New Year's Day. 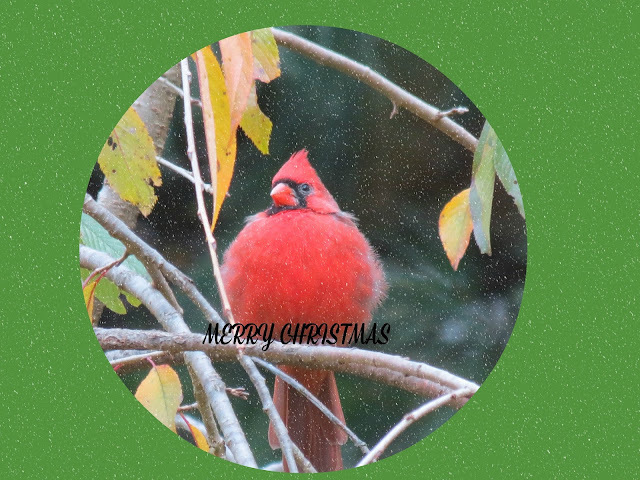 My Christmas ball Cardinal. He looks like he might explode. Thanks for your visit today! I hope you enjoyed my post and photos. Thanks to LadyFi and the hosting team of Our World Tuesday! I hope to see you there. Thanks to the hosts today. Enjoy your day and new week. As always I thank you for stopping by and as always I appreciate your comments. 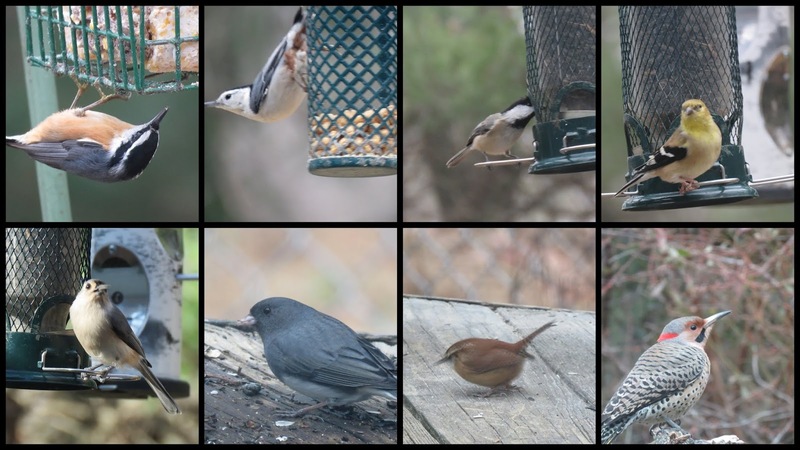 I am sharing my yard birds from Nov 24th. 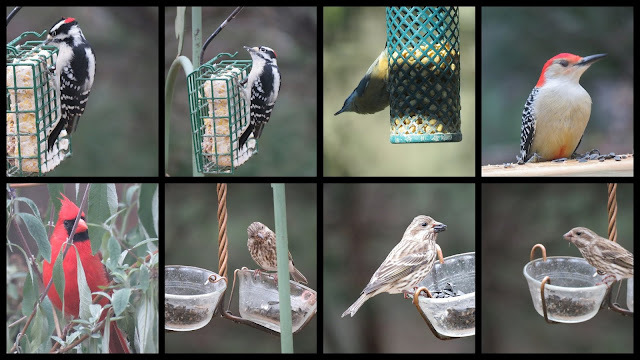 The mosaic below on the top row is the Downy Woodpecker, Red-breasted Nuthatch, Red-bellied Woodpecker. 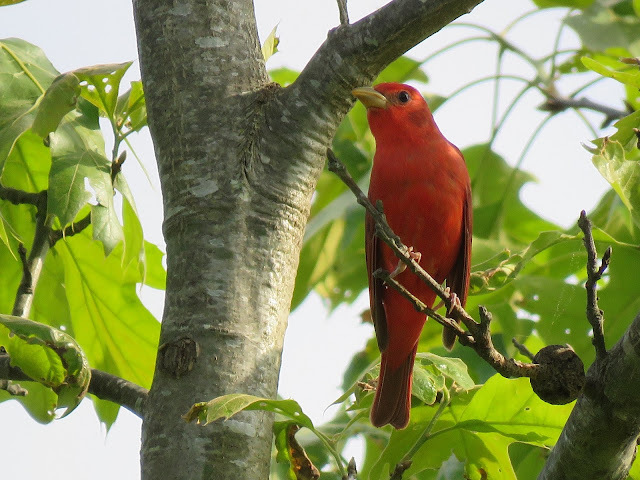 Bottom row, male Cardinal and a female Purple Finch. Mosaic below, Red-breasted Nuthatch, White-breasted Nuthatch, Carolina Chickadee, American Goldfinch, Tufted Titmouse, Dark-eyed Junco, Carolina Wren and a Northern Flicker. A larger image of the male Downy Woodpecker.. The female does not have the red spot on the head. The Chickadee looked funny stretching it's neck to reach the bird seed. My backyard woodpeckers, the Northern Flicker, Downy Woodpecker, Red-bellied Woodpecker and the Yellow-bellied Sapsucker. Happy Birthday to my son, Dec 7th! I hope no one is tired of seeing my moon photos. 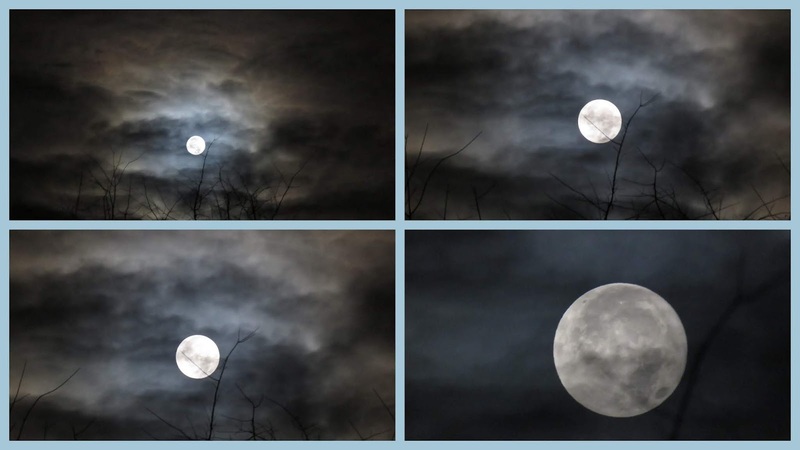 I took some more photos of the full moon in November. 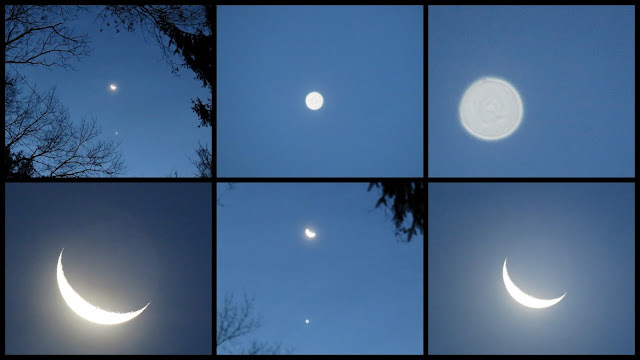 I am thankful for some clear nights and morning where I can see the moon looking beautiful. Here is the moon in a mosaic taken on Nov 22nd. On the morning of November 23rd we had cloudy skies. I think it made the moon images look a little more dramatic. The November full moon is called the Beaver Moon or the Full Frost Moon. 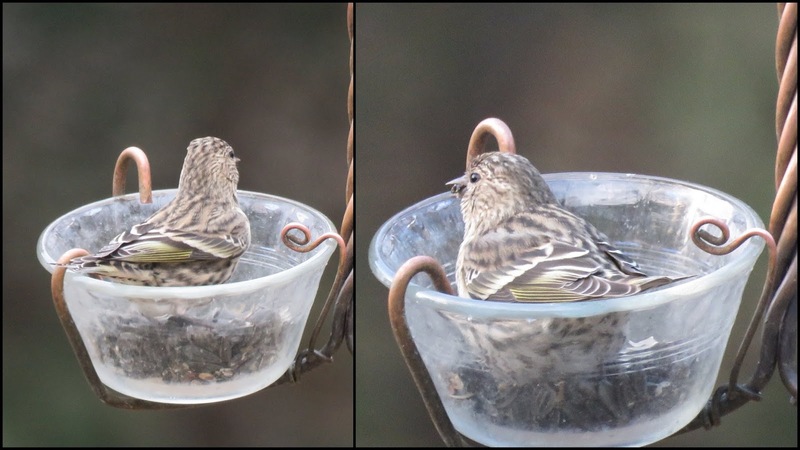 Nov 23rd the Pine Siskin in a cup. I put some sunflower seeds in these cups and the birds were sitting in the food and chowing down. One of my winter birds is the Dark-eyed Junco. They enjoy eating off the ground or deck. 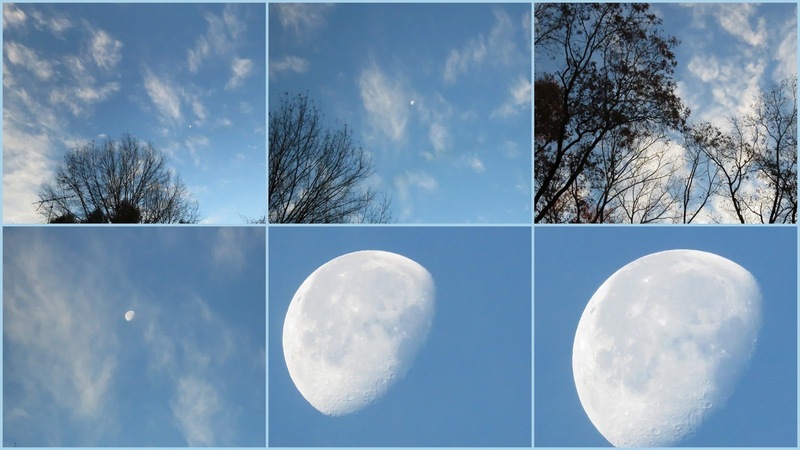 Some pretty skywatch images from Nov 27th. I am thankful for the simple pleasures, like skywatching and birdwatching.